Starting the Year Off With a Bang-le! Since forever, I’ve had this tradition where each new year, I go on an absolute OCD-like shopping frenzy for a piece of jewelry that will somewhat define and commemorate my year to come. Somewhat like Carrie Bradshaw with her “Carrie” necklace, I go about the next destined 365 days wearing it until it falls off into pieces, gets lost or stolen, (boo!) or – if I’m most lucky – when the next new year comes and I get to stash it away forever. Throughout the years, this tradition has morphed into an irreplaceable jewelry box that is like a scrapbook or photo album of experiences past. Wherein, each piece possesses a meaning and sentimental value, worth far beyond any price tag. The necklace/bangle/ring becomes part fashion statement and part good luck charm. And since this very important bauble is going to be my companion for the next 12 months, there is a pretty strict note of criteria that accompanies it: The object must be extremely sturdy, comfortable, priced in a practical price point, and blend with almost every outfit I will wear. After a long list of possible VIB’s, my heart finally set itself on (drum roll, please…) House of Harlow 1960’s Black Stack Bangle. For a literal “edge” to your look, try the House of Harlow Five Stacked Jagged Rings. 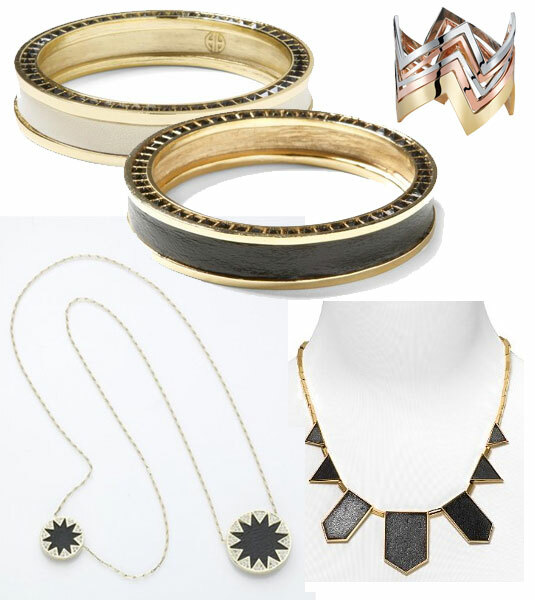 For the celebrity favorite, the Leather Drop Necklace has been seen on Kim Kardashian, Kerri Washington, and more. For sunshine even on the most cloudy days, take a gander at the Sunburst Station Necklace.